Wow Outland Forest Escape is another point & click escape game developed by WowEscape. In this game, you came to see the beauty of an outland forest. But unfortunately, you missed the way out from that place. You have to find the way to escape by finding useful objects, hints and by solving puzzles. Click on the objects to interact with and solve puzzles. Good luck and have fun! Knife used on tree in start scene, stays in inventory. 2nd set: give brown nut to chomping monster. Pour watermelon into green container in same chomping monster scene. 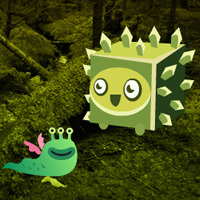 Use stick on alien spaceship in scene where you place 3-eyed green monsters. Very cute game, thanks WOW.